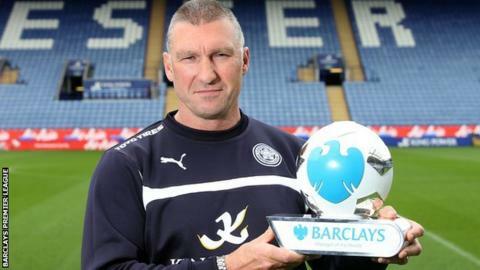 Leicester boss Nigel Pearson has been named Premier League manager of the month for April. The Foxes boss oversaw a run of four straight wins that lifted the club out of the relegation zone. Pearson courted controversy last month by calling a journalist an "ostrich" in a bizarre post-match news conference, for which he later apologised. Aston Villa striker Christian Benteke is the player of the month for his five goals in four games. This included a hat-trick in Villa's 3-3 home draw with fellow relegation-threatened QPR and the winner in his side's 1-0 win at Tottenham, which helped put distance between Tim Sherwood's side and the bottom three. This is the first time 51-year-old Pearson has won the top-flight managerial award. "I'm flattered but it's not just about one person. I'm very conscious of the support I get from staff and players - it's recognition of a bigger picture," said the former Hull City and Southampton manager. The accolade came after successive victories over West Ham, West Brom, Swansea and Burnley lifted City off the bottom of the table for the first time since November. Jose Mourinho steered champions Chelsea to four wins and a draw in April but has failed to win Premier League manager of the month all season.